A line graphs class to teach interpreting and creation of line graphs. 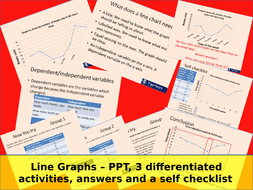 Resources for the whole line graphs lesson. This is a whole lesson for teaching interpretation and making of line charts/graphs. It begins with an introduction to the key parts of a line graph and examples of independent/dependent variables, gives students a few questions to answer to show understanding and to think about WHY the graph may show what it shows. There is an activity at the end differentiated into 3 groups, with a self checklist for students and an explanation of the answers.